When storage is limited in your home and you don’t have any spare floor space to accommodate an extra cupboard, bookshelf or set of drawers, there’s only one thing you can do: climb the walls. These snazzy, space-savvy wall storage solutions are proof enough that if you need a little extra room to stash bits and bobs around your house, you can make them easy to find without creating an eyesore in the process. While I’m a big fan of wall-mounted shelving, I’m particularly enamoured with the chic acrylic floating shelves used in this kitchen. 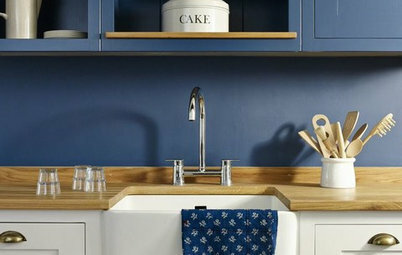 Not only do the wide, deep surfaces provide plenty of room to stash kitchen essentials and display a selection of decorative accents, they also create the illusion of space as they blend in seamlessly with the walls. 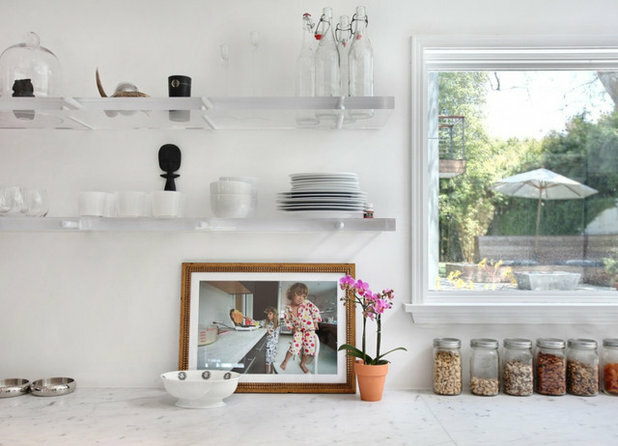 See-through shelves like these can also be installed across a window if you’re in need of even more storage, as they won’t compromise your view or stop sunlight from flooding your space. 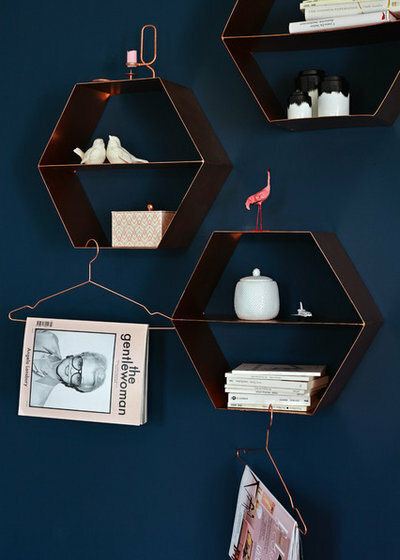 If you find basic floating shelving a tad boring, invest in statement-making shelves that double as wall décor, like the trio of striking copper hexagonal-shaped shelves pictured here. 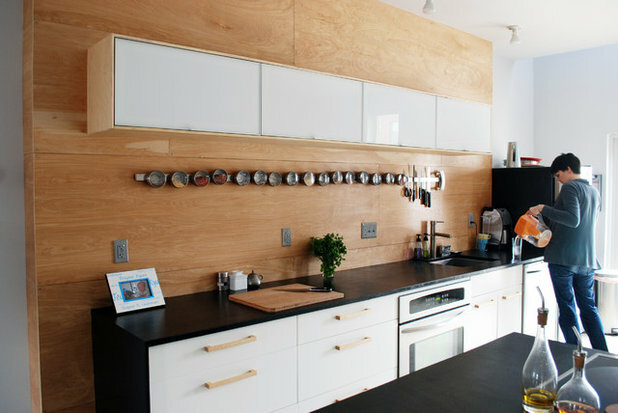 Magnetic strips are a great storage solution for the kitchen. 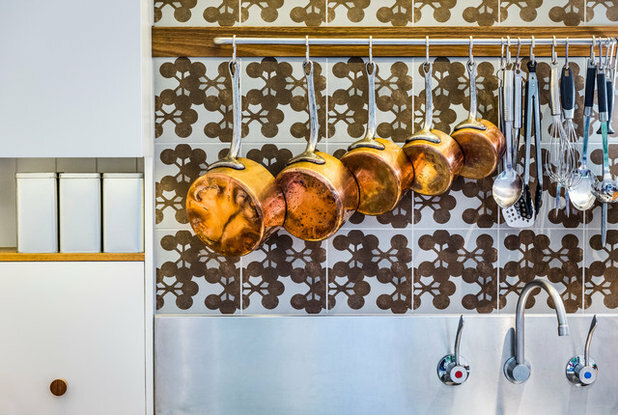 Not only will they free up valuable drawer space and ensure kitchen essentials, such as knives, scissors, herb and spice tins and metal measuring spoons, are easily accessible, the creative display will act as a foodie-themed wall accent, too. 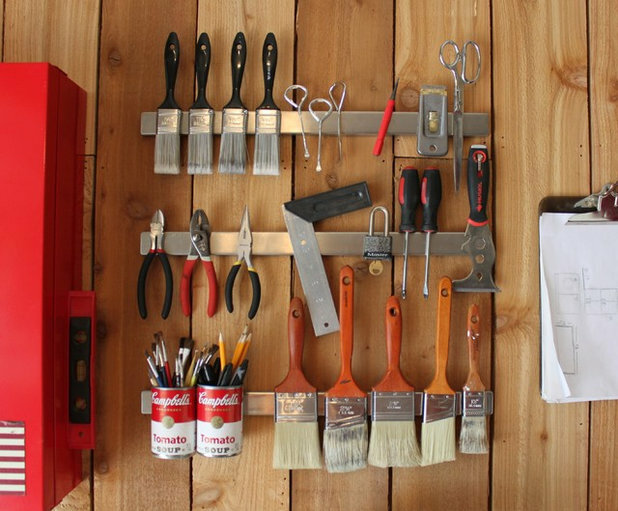 You should also consider installing magnetic strips in your garage, as they will corral loose, messy items, such as paintbrushes, pliers, screwdrivers and other bits and bobs that are easily lost. 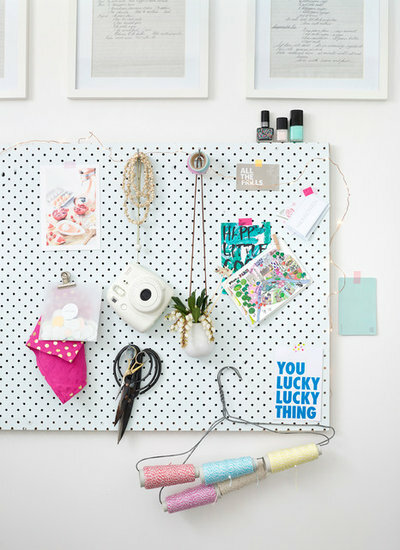 Pegboard is popping up all over Houzz as a vertical storage solution for jewellery, colourful craft supplies, kitchen utensils and other petite items around the home. Add extra storage power to any room in your home by affixing hooks to your wall. 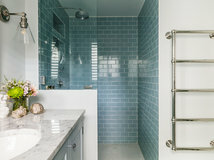 Install them in your bathroom so you have a place to pop your robe or clothes while you shower; on the side of your wardrobe to wrangle handbags and scarves; and in your hallway so you have somewhere to stash your jacket, bag or keys as soon as you walk in the door. Before you buy hooks for your home, make sure they are suitable for your particular walls and can bear the weight you want them to hold. 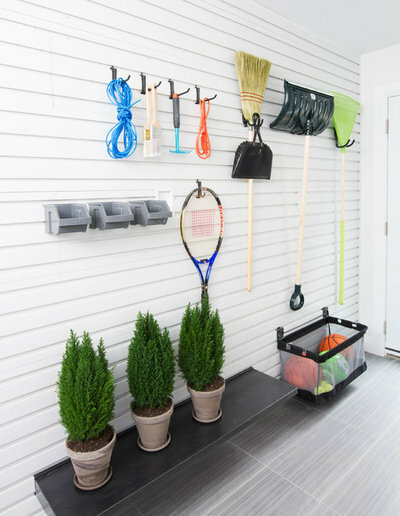 Take storage cues from this beautifully styled and organised set-up and opt for a slatwall in your utility room or garage. 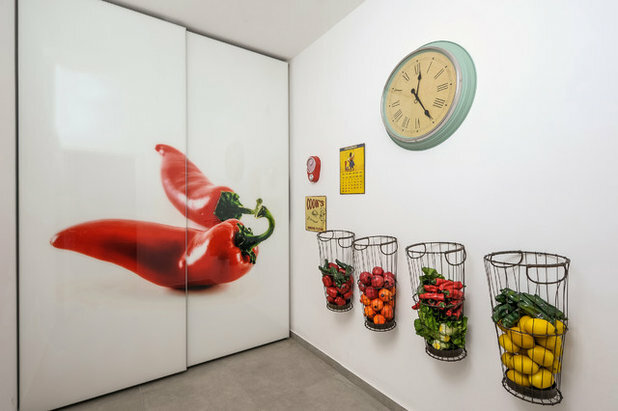 The best thing about this nifty vertical storage solution is that it’s fully customisable and can be kitted out with hooks, tubs, shelves and baskets, depending on your needs. Plus, you can easily rearrange the placement of the slatwall storage accessories when you need to add (or remove) items to the line-up. It’s OK to be a basket case… when choosing vertical storage solutions for your walls, that is! 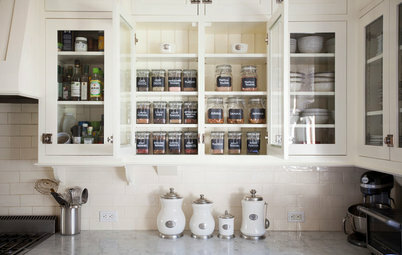 In the kitchen, wall-mounted wire baskets provide ideal storage for fruit and veggies; and why stop there? You can also use them for plenty of other household items that build up, including towels, toys and shoes. Solid wall-mounted baskets are an ideal alternative to wire tubs if you need to store items that are messy or you’d prefer to keep hidden from sight. 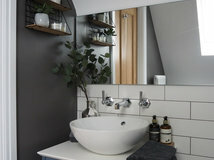 Another neat trick to take from this compact bathroom is to mount a column of baskets down your wall if vertical space is limited in your room. This will ensure the available surface area is maximised. Wall-hung rails deliver practical, space-maximising and visually appealing storage to any area in the home. 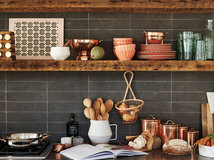 Use them to store everyday essentials, such as a prized copper cookware collection like this, which should be easily accessible and deserves to be on show. 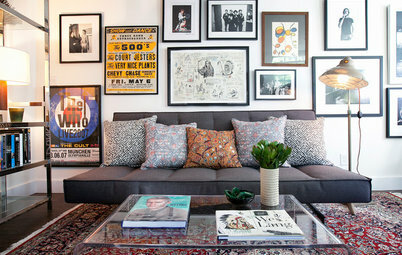 Wall-mounted furniture makes a bold style statement, frees up floor space and also helps visually expand a room. Oh, and it also provides a handy spot in which to stash your stuff, of course. 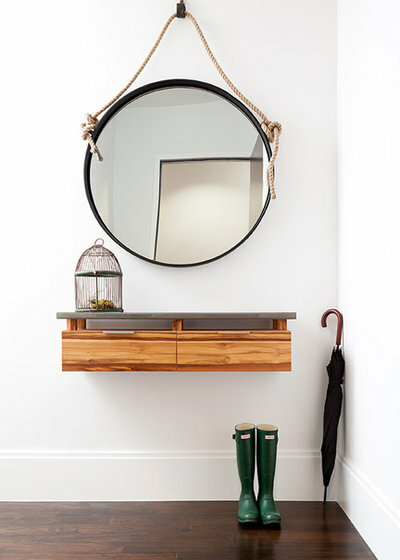 When positioning your suspended storage unit, whether it be a wall-mounted bathroom vanity unit or a suspended console table for your hallway, make sure the cabinet stands at a comfortable height so you don’t put unnecessary strain on your back or neck when making use of it. A floor-to-ceiling shoe rack (or one that almost spans the height of your room, like the one pictured here) is a must for any footwear lover. Wall-mounted shoe storage systems will help streamline your morning routine, as all of your beautiful kicks will be easily accessible and on display, rather than hogging space at the bottom of your wardrobe. 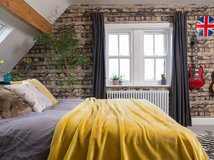 An open-air storage system, which doubles as a fashionable feature wall, will also ensure your shoes are kept in a well-ventilated environment and will remain dry and mould- and odour-free. 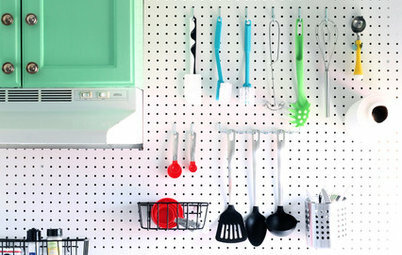 Do you have any space-saving wall storage solutions in your home? Share your tips and photos in the Comments below. Fabulous ideas. 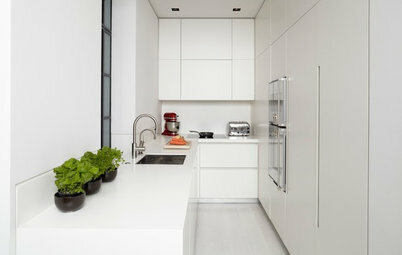 I loved the see through floating shelves! Would look fab in my soon to be renovated bathroom. Where are they from Natasha? 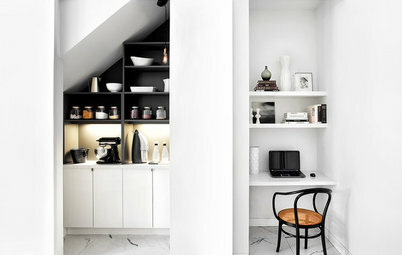 Yes, please can you tell us where the clear shelves are from?! Where can you buy these thick clear acrylic shelves in Australia?? They are just what I want in my kitchen! 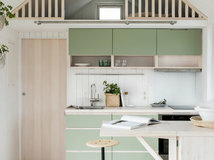 Most Popular Ask a Builder: How Do I Make the Most of My Small Kitchen? Whether wall-mounted or freestanding, a TV is an essential in most living spaces. But where’s the best place to put it?